trademark for preparations of hydrocortisone, a glucocorticoid used as an antiinflammatory and immunosuppressant agent. Adults and children: 20 to 240 mg/day P.O. Adults and children: 100 mg P.R. at bedtime for 21 nights or until desired response; patient should retain enema for at least 1 hour. • children ages 6 and younger (safety not established). • Give oral form with food or milk to avoid GI upset. • Give I.V. injection of sodium succinate form over 30 seconds to a few minutes. • Know that drug may be given as intermittent or continuous I.V. infusion. 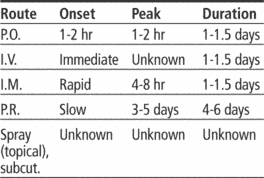 Dilute in normal saline solution, dextrose 5% in water, or dextrose 5% in normal saline solution. • Inject I.M. deep into gluteal muscle. Rotate injection sites to prevent muscle atrophy. • Be aware that subcutaneous administration may cause muscle atrophy or sterile abscess. ☞ Never abruptly discontinue high-dose or long-term systemic therapy. • Know that systemic forms typically are used for adrenal replacement rather than inflammation. • Be aware that occlusive dressings, heat, hydration, inflammation, denuding, and thinning of skin increase topical drug absorption. ☞ In high-dose therapy (which should not exceed 48 hours), watch closely for signs and symptoms of depression or psychotic episodes. • Monitor blood pressure, weight, and electrolyte levels regularly. • Assess blood glucose levels in diabetic patients. Expect to increase insulin or oral hypoglycemic dosage. ☞ Monitor patient's response during weaning from drug. Watch for adrenal crisis, which may occur if drug is discontinued too quickly. • Instruct patient to take daily P.O. dose with food by 8 A.M.
☞ Urge patient to immediately report unusual weight gain, face or leg swelling, epigastric burning, vomiting of blood, black tarry stools, irregular menstrual cycles, fever, prolonged sore throat, cold or other infection, or worsening of symptoms. • Tell patient using topical form not to apply occlusive dressing unless instructed by prescriber. • Advise patient to discontinue topical drug and notify prescriber if local irritation occurs. • Instruct patient to eat small, frequent meals and to take antacids as needed to minimize GI upset. • Tell patient that response to drug will be monitored regularly. • In long-term use, instruct patient to have regular eye exams. • Instruct patient to wear medical identification stating that he's taking this drug. A trademark for the drug hydrocortisone. If cortisone levels still remain low and the patient does not have Addison's disease, then a subtherapeutic dose of Cortef may also be beneficial. Many physicians use Cortef (hydrocortisone tablets) and follow the procedure suggested by co-discoverer of hydrocortisone in 1949, William M.